Discussion in 'Convert video to another format' started by Bri7man, Jul 8, 2011. I have windows xp pro 64 with SP2 and I tried installing ac3 filter from ac3filter.net with 32 and 64 bit driver checked, only 32 checked, and only 64 checked, each time reinstalling gotsent and adding in neroaaccode to the gotsent folder and each time ac3filter options in gotsent does absolutely nothing..
Any ideas?? Im pretty bummed.. I figured it out, I had to install ac3filter to the drivers folder in my comp and into the ac3filter folder inside gotsent. Both with 32 and 64 drivers checked. Sorry, that must have not been the solution, because I am trying to get it to work on my new HD with a fresh OS of win7 x64 ultimate and no luck. 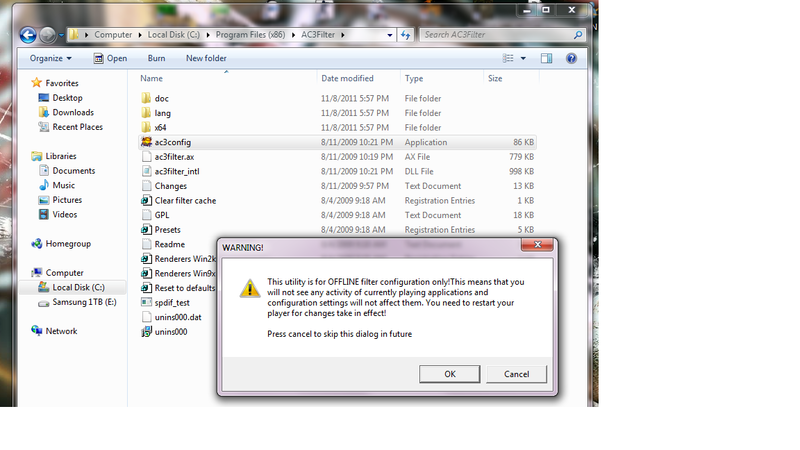 At that time I did have a TON of encoding software on my comp. No idea, it really is a mystery to me. Something to ask would be when installing Haali media splitter for Gotsent to work, is what options needs to be ticked or unticked when installing such as:'Disable mpc internal matroska splitter', 'Disable Gabest Matroska splitter', 'enable avi support' ..etc. There really hasn't been much support on the topic regarding getting gotsent working properly in this sense.